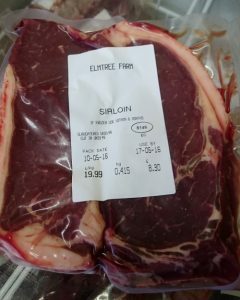 If you’re in Bristol and looking for local beef, look no further than our Elm Tree Farm shop. Today marked the culmination of over two years hard work to supply delicious local beef direct from the Farm. We have a range of cuts available including roasting joints, steaks, diced, mince, and burgers, all ready to be cooked and enjoyed. Our beef cows are Aberdeen Angus crossed with Hereford cattle and eat only grass and hay from our herb rich traditional meadows. No pesticides or fertilisers are used on the land and the cows have plenty of space to roam. If you drive down the M32 motorway into Bristol you can often see them grazing in the fields on the left-hand side opposite Stoke Park. We believe we provide some of the highest possible welfare meat and, almost definitely, the most local if you’re in Bristol. The cows are a big favourite with some of the people we support on the Farm and they get involved in all aspects of care from daily checks, to watching them calf, to mucking out their pens in winter. We’d love to see you down at the Farm shop and provide you with a tasty dinner or barbecue treat. We think it’s likely to be the best meat you’ll ever taste!